The title of this post may be a slight exaggeration. I actually recommend you read the entire two-page paper by Devon Herrick of the National Center for Policy Analysis. But this chart from that study is an excellent visual display of what’s wrong with the health care system. Study this image for two minutes and contemplate the implications. After that, you’ll know more about healthcare economics than 98 percent of all politicians (though that’s not exactly a huge accomplishment). I think the “discretionary purchase” argument is weak, also, but not for the reasons stated so far. Just because you have to buy something doesn’t mean you want to pay more for it than you have to. Food and housing are not discretionary purchases, either. You still shop around to find the best price. People think that you have to buy a kidney transplant so you will pay whatever the doctor asks, but, as long as you have time to make a choice, you will find the best price. If one is having a heart attack or is otherwise constrained from shopping around then the purchase is genuinely non-discretionary and the consumer would be open to being gouged, but the proportion of medical care purchases that fall into this category is probably not large. The argument that most medical services are a necessity compared to cosmetic surgery is a weak one. The IOM recently released a report detailing that $750 billion of health care spending (30%) is actually excess cost. $210 billion was identified as unecessary services, $130 inefficient services, $105 billion excessive prices. This is in line with many studies showing provider induced demand and consumer preference drives large variations in small area utilization of procedures such back surgery and cardiac cath. These variations can’t be explained by medical necessity. I agree with Bragg, the demand curve for discretionary purchases is always going to be more responsive to prices than the curve for necessities. In addition, aren’t the conservative economists the ones who argue that employer paid health care is actually passed on to the employee in the form of lower pay? If so, then payment for both cosmetic care and other care is coming out of the patient’s pocket. 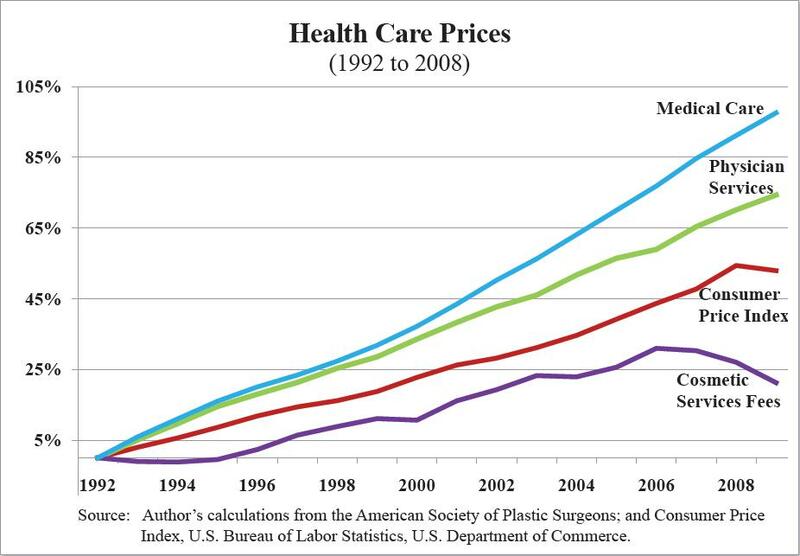 But cosmetic surgery is discretionary, while most other medical costs are necessary. That has to be a main reason why costs have not risen for cosmetic surgery. I just finished a paper on this topic, using Arnold Kling’s “Crisis of Abundance” as my economic framework.